Cal/OSHA has fined a fuel distribution company $99,345 following an investigation into an explosion at the company’s facility that killed one employee and left another with severe burns. The owner of the company had been previously cited for similar incidents. On May 6, 2014, two employees attempted welding operations on a 9,000-gallon tanker truck containing an unknown amount of crude oil. The tank had not been purged or tested for flammable vapors, resulting in the explosion. One of the employees, a welder who had been with the company for four years, was found dead on the floor of the facility with his right hand and lower arm completely severed. The second employee, with five years of experience, suffered burns to more than 50 percent of his body. Investigators from the San Bernardino Cal/OSHA District Office determined that the company contributed to this incident by failing to have required safety procedures in place for working with flammable vapors. Additionally, investigators found that the company failed to train employees on the dangers of welding near combustible materials. “California requires employers to have and adhere to an Injury and Illness Prevention Program” said Christine Baker, Director of the Department of Industrial Relations (DIR). Cal/OSHA, formally known as the Division of Occupational Safety and Health, is a division of DIR. “This preventable death is a reminder of what can happen when that requirement is ignored,” said Baker. While investigating the May 6 event, investigators learned about a previous explosion at the same facility that occurred under similar circumstances, and involved the same two employees. On September 25, 2012, the lid of a fuel tanker blew through the ceiling of the repair facility after the employees commenced welding on a truck filled with flammable vapors. No injuries occurred on that date. The Federal Motor Carrier Safety Administration served the company with an emergency restriction order on August 14, prohibiting the company from using cargo tank motor vehicles. The company appealed the order in September. The company’s owner had served prison time following a 1993 incident that occurred while he was operating another business. 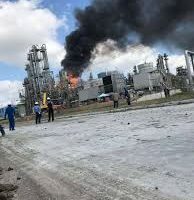 In that incident, there was an explosion involving welding operations on a fuel tanker that had also not been purged or tested. This incident also took the life of a welder.